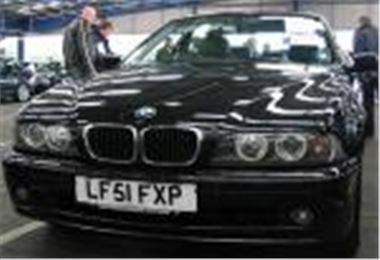 Clean 2001/51 BMW 525iSE manual on 15” wheels with 225/60 comfort tyres, leather, 95k miles and 8 BMW stamps. Bidding started at £3,500 and ended with someone driving it home for £4,550. Lot of car for the money. A 79k mile 02 reg Mercedes W210 E320CDI A/G reserved at £7,500 sold for £9,525. One of the worst Yaris I’ve seen, an 80k 99V GS in matt white with a damaged and rusted door sold for £1,525. 72k mile 02 Mitsubishi Carisma 1.9D-ID Mirage with leather £2,250. So, while the 525iSE and the Carisma were cheap, not much else was. Here’s the list. ‘s’ means sold. ‘n/w’ means unwarranted mileage. ‘p’ means top provisional bid. ‘n/s’ means not sold, ‘D/R’ means damaged and repaired. TOP CAR, Porsche Retail p/x, Black Horse, Fleet & Finance, Franchised Dealer, Inchcape no reserve p/x, Reg Vardy p/x, Hartwells p/x, Pendragon p/x, Lex. Fleet & Finance, Hitachi Finance, Renault Financial Services, Lex, Citroen UK, General Section, Jardine p/x, Leaseplan, Sytner p/x, Black Horse, Inchcape p/x, Snows Group p/x, Trident Honda p/x. Light Commercials from Leaseplan, Bank of Scotland, Citroen, Dagenham, Northgate, Fleet Direct, Hitachi. Fleet & Finance, LTSB Autolease, Leaseplan, Motability, Lex, General Section, Citroen UK, Velo Ltd., Vauxhall Leasing, Hitachi Capital, Gowrings of Newbury p/x, Charters p/x, Private Direct, Inchcape p/x. Fleet & Finance, Ridgeway VW p/x, Bank of Scotland, Porsche Retail p/x, Lex, Franchised Dealer p/x, Inchcape no reserve p/x, Reg Vardy Group p/x, Hartwells p/x, Pendragon p/x. Fleet & Finance, Arval, Alphabet GB, Leaseplan, Lex, Jardine p/x, Sytner p/x, Black Horse, General Section, Inchcape p/x, Snows Group p/x, Trident Honda p/x. Light Commercials from Lex, Lloyds, Peugeot, Northgate, Fleet Direct, Royal Mail. Fleet & Finance, LTSB Autolease, Velo Ltd., Leaseplan, Motability, Lex, General Section, Citroen UK, Peugeot Motor Co., Hitachi Capital, Gowrings of Newbury p/x, Peugeot Charters p/x, Private Direct, Inchcape p/x. Top Car, Porsche Retail p/x, Black Horse, Fleet & Finance, Franchised Dealer p/x, Inchcape No Reserve p/x, Reg Vardy Group p/x, Hartwells p/x, Pendragon p/x, Lex.